Patricia Hewitt, the Health Secretary, has said that the Government should have capped GP Salaries when the new contracts were introduced in 2004. "I think if we anticipated this business of GP's taking a higher share of income in profits we would have wanted to do something to try to ensure that the ratio of profits to the total income stayed the same and therefore more money was invested in even better services for patients,” she said. The intention was for GP's to use the funding envisaged by the contracts to improve patient care, instead of doing this, GP's up and down the country have used funding / profits to increase their salaries by over 30% in one year alone !, taking the average salary to an estimated £106,000. As we highlighted in our last article NHS GP's enjoy record pay for less hours whilst neglected patients suffer , Due to self imposed pay rises of 30%+ most GP's have now opted out of traditional services such as out patient / weekend care and holiday cover. For which the NHS now has to bring in doctors from abroad. The total rise in pay in just 3 years is estimated at some 65% (Source The Association of Specialist Medical Accountants). The surge in pay has meant that there is less incentive for GP's to spend time in surgeries as even if GP's worked on a part-time basis they would still end up more money than they would have received on a full-time basis prior to the 2004 GP contracts fiasco. The surge in salaries is not only limited to GP's but to the wider Health Service, where the vast majority of the extra spending is purely being wasted in salary increases. This has lead to large deficits in NHS trusts throughout the UK. The NHS today costs Britain in excess of £100 billions compared to the £34 billions when New Labour came to power. However the actual increase in output from a near tripling in expenditure is estimated at less than 30%. Patients continue to suffer due to a Health Service that increasingly focuses on those on the gravy train, collecting large salaries at tax payers and patents expense rather than to focus on the task of efficiently diagnosing and treating patients. Much of this article can be backed up by personal experiences of readers of this article as well as the writer. As my own experiences of using my local NHS surgery. Where attempts at arriving at diagnoses literally results in a shoulder shrug from the GP, rather than any real effort to perform the duties of a GP. 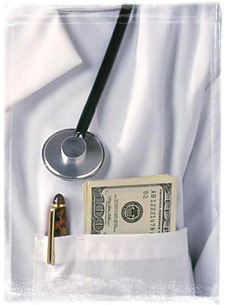 The only effective means of diagnoses for many patients is via a private GP services. The root cause of this problem is the near 70% rise in pay in 3 years. There seems to be no longer any real incentive to 'work hard', or perhaps the money has gone to the heads of many GP's resulting in arrogant, self centered behavior and complacency, losing touch with the primary purpose of what it means to be a GP. Meanwhile patients continue to be neglected and suffer and in some cases DIE early deaths, due to lack of care and responsibility amongst many GP's awash with too much money in the UK. Similarly patients are needlessly dieing in NHS hospitals from preventable infections such as caused by MRSA. A leaked memo yesterday states that the goverment is unlikely to meet targets set in 2004, to cut MRSA cases by half by 2008. The memo was sent to ministers in October 06, by the director of health protection, Liz Woodeson. The memo said, "We have a three- year target to halve the number of MRSA bloodstream infections by April 2008. Although the numbers are coming down, we are not on course to hit that target and there is some doubt about whether it is in fact achievable." The memo, also said the infection Clostridium difficile (C diff) is "now endemic throughout the health service". Please post your comments on experiences of the current state of GP and NHS services in the UK. complaining for all the good it will do? Delivering good medical practice to our patients, (or the lack of it) is and shall certainly remain an important issue amongst the medical community for now and undoubtedly for the future. The GMC regulates doctors, ensuring the best possible care is provided to their patients. It’s mandatory for a GP has to submit an annual evaluation of their work to the GMC, and if this falls below the high standards set by the GMC, then the doctor is critically assessed and may be struck off the register. Hope this helps you Lisa, as the NHS were given a £110bn investment by Westminster in the fiscal year of 2007/08, consequently in my opinion, it’s crucially important that we get optimal clinical efficiency!